Customers from across the southeastern United States have made Bondy's Ford Lincoln their top choice for the highest-quality vehicles since our doors first opened in 1970. As the favored Ford and Lincoln dealer in Dothan AL, we carry an extensive inventory of the newest models and pre-owned selections, as well as used automobiles by other reputable manufacturers. Whether you are looking to enhance your daily commutes or need a dependable pickup for hauling, Bondy's Ford Lincoln is more than ready to help you choose the perfect car, truck, or sport utility vehicle (SUV) in our pressure-free atmosphere. Our friendly team of Ford and Lincoln experts not only has comprehensive knowledge of the many automobiles available here at Bondy's Ford Lincoln, but also truly understands the unique needs of drivers in the local areas. From touring old farm buildings on Landmark Park to spending an afternoon of family fun at Adventureland and strolling through beautiful Dothan Area Botanical Gardens, we are active members of the Dothan community who know firsthand what type of vehicles best fit the various lifestyles of fellow residents. 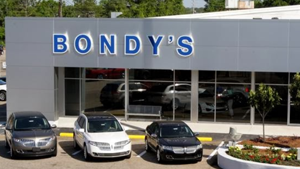 Visit Bondy's Ford Lincoln in Dothan AL to make use of our long history of automotive expertise and ensure you have a positive dealership experience. We are committed to turning every prospective buyer into a lifelong customer.